If anyone's still looking for a little something to pick up for me for Christmas, I would have no objection to a LockLite. 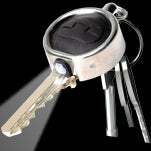 This simple little device attaches to the head of a key and adds an LED flashlight, making it easy to find and operate those door locks in the dark. I can't tell you what kind of godsend this would be. The front door of my apartment opens into a little cramped vestibule that doesn't have a light (okay, technically it does have a light, but we have no idea where the switch is), and, honestly, it's so difficult to get the key into the damn lock that for the first several weeks I thought that some jerk had magnetized the key and lock with opposing polarities. Then again, maybe that just says something special about me. The LockLite shines a 3m beam that is supposedly visible at up to a mile away, and runs for 100,000 hours before requiring that you change the battery. Best of all, it costs just £3.99 (~$8).